KUALA LUMPUR: The free trade agreement (FTA) negotiations between Malaysia and the European Union (EU) will include a discussion on the recent resolution by the EU parliament to phase out the use of certain vegetable oils, including palm oil, by 2020. Deputy Minister of International Trade and Industry Datuk Chua Tee Yong said although the resolution is non-binding on EU member states, the government viewed the recent development very seriously, as it involved a major export commodity and the livelihood of about 500,000 smallholders. “With the resumption of the FTA negotiations, we will definitely put it up for discussion,” he told reporters after officiating the EU-Malaysia Trade and Investment Forum 2017 yesterday. He said the resolution, however, doesn’t ban entirely palm oil from being exported to the EU. “It is more a concern about whether there will be additional tariff measures to be implemented,” he added..
Chua said the government would look into ways of resolving the matter to ensure the resolution did not disrupt trade between both sides. Ambassador and Head of the EU Delegation to Malaysia Maria Castillo Fernandez said she does not expect the resolution to affect bilateral relations between the EU and Malaysia. “No change in EU trade and investments in Malaysia. We will continue to be the third largest trading partner with Malaysia,” she added. 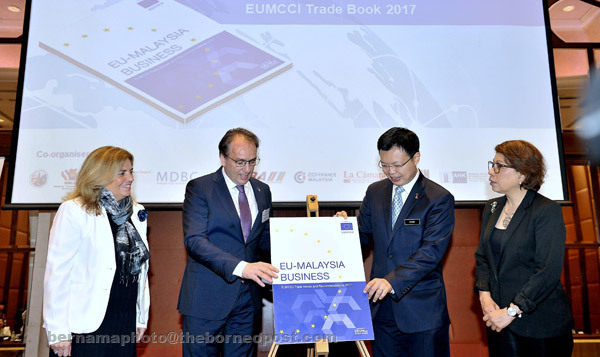 Malaysia-EU total trade in 2016 rose 0.4 per cent to RM149.1 billion year-on-year, while in January 2017, it increased 9.7 per cent to RM12.9 billion from the corresponding month a year ago. Meanwhile, organised by the EU-Malaysia Chamber of Commerce and Industry (EUMCCI) and themed, “Innovation and Productivity to Drive Malaysia’s Economy”, the one-day Forum is aimed at improving the productivity of the manufacturing and services sectors, as well as competitiveness, by encouraging the players to adapt and embrace innovation as well as diffusion of new technologies. In conjunction with the Forum, Chua also launched the EUMCCI Trade Issues and Recommendations 2017 publication.